Mission Statement: Harp & Soul’s purpose is to provide professional-level musicians who are passionate about music, flexible to adapt to any situation and excited to explore new opportunities with the overall goal of creating a live music experience unique and adaptable to each client. Harp & Soul believes in the collaborative process to bring music in various forms to its vast audience. From solo musicians to larger ensembles, we proudly coordinate to provide the musical backdrop for your unique event. All musicians are experienced professional musicians who have devoted years to their craft. Quality drives our vision to provide live music entertainment for your wedding day, private party or corporate event. We have a network of wonderful musicians and will let you know when your request is something we do not specialize in so that you can peruse other outlets that are a better match for your needs. Our clients seek us because of the diversity of the repertoire we offer as well as the professionalism of our musicians and careful preparation we put into each event. Our ability to cover an eclectic array of repertoire and ability to take on new and special requests is an added bonus. As our name hints to, the harp is what Harp and Soul is all about. This magnificent instrument has an expansive and wonderful history while also being extremely diverse in its capabilities. Therefore, a professional harpist can still present popular hits and other favorites in an acoustic context where the audience still is able to appreciate the different melodies and harmonies that work together to make the music. We have educated many clients to the fact that when referring to the “orchestral” string section, the harp is not included as it is not a bowed instrument. The harp is also not limited to playing one line of music at a time like other orchestral strings [i.e. violin, viola, cello, bass]. Because of the limitations of bowed stringed instruments, we do not recommend using them as solo instruments for more intricate or modern pieces that rely on two or more moving parts for the audience to enjoy some semblance of the original composer’s intent. However, as these instruments are beautiful and rich in sound, we highly recommend pairing them with the harp or piano as they lend a lovely compliment. The harp and cello duo is our most popular combination for wedding ceremonies, cocktail hours, corporate live entertainment and private parties/receptions. The richness of the cello is enhanced against the full, percussive sound of the harp lending to a perfect marriage of timbre and resonance. 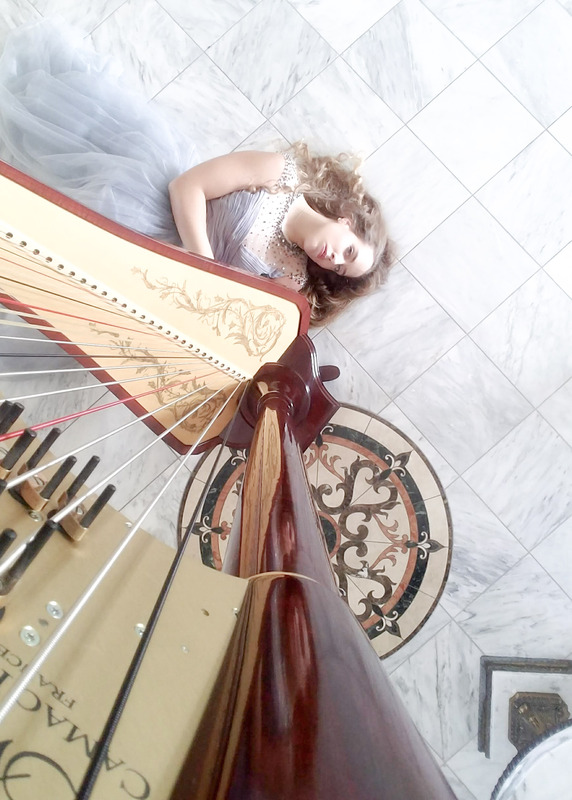 Nichole Rohrbach, is the owner and CEO of Harp & Soul as well as the primary harpist and pianist. Nichole currently maintains a residence in both Atlanta and the Philadelphia area. Nichole received her Bachelor’s of Music degree in Harp Performance as well as a Masters of Arts in Theatrical Production. She currently serves on the board of the Philadelphia Chapter of the American Harp Society as Vice President where she works with elected officials to organize harp events for the Greater Philadelphia area. Nichole has professional ensemble experience performing as harpist with the Mid-Atlantic Symphony Orchestra, Reading Pops, St. Peters by the Sea Orchestra, Fountain Inn Symphony Orchestra, the South Carolina Children’s Theater, Reading Symphony Youth Orchestra, The Reading Philharmonic, The BJU Symphony Orchestra, The BJU Harp Ensemble and Anderson Cancer Society’s Concert for the Cure. In addition to ensemble experience, Nichole is in demand as a professional solo musician. Various corporations, businesses, non-profit organizations and fundraisers have employed her services. Over the past few years, Harp & Soul has seen a surge in the demand of services. Performing for hundreds of clients in PA, NY, DE, NJ, MD, CT, MA, VT, NC, SC, CA, CO, FL and GA. Harp & Soul’s services have been sought after by prestigious clients including BMW, One Atlantic, Warby Parker, Bloomingdales, Lord & Taylor, The Rittenhouse, and many others. Nichole’s educational experience as a musician provided her an outlet to be involved with a broad spectrum of musical opportunities. She was a charter member of the University Chamber Harp Ensemble a position which she held for more than six years. Nichole was invited to perform original works of composition students, collaborated with conductors and composers on new works, was involved in recording a new soundtrack for a play, and participated in several experimental programs that involving the harp. Nichole maintains a private harp studio in Atlanta, GA and Pottstown, PA.
Noelle Bryant, has served the longest tenure providing music in collaboration for Harp & Soul Clients. Noelle studied cello under Chris Lee while attending college and participated in several ensembles and orchestras including: The Reading Symphony Youth Orchestra and the BJU Symphony Orchestra. Noelle has been performing for 10+ years and has performed for hundreds of events as a professional cellist. Noelle is also featured in many of Harp & Soul’s recordings and videos. Caroline Lee Roland, is a professional cellist residing in Roswell, GA. Caroline received a Bachelors of Music Education degree with a concentration in Cello. Following graduation, Caroline joined the Galkin Evangelistic Ministry Team as their cellist, traveling around the country and performing as part of the Irish Concert series. Caroline joined Harp & Soul in 2017 when Harp & Soul expanded to Atlanta, GA and his the primary cellist for the greater Atlanta area. Jaclyn Duncan, Boston University graduate (2000), brings years of diverse musical experience to every performance. Trained classically on the piano, Jaclyn has performed as an accompanist at many prestigious schools and concert venues including The Juilliard School and New England Conservatory. In addition to collaborative piano, Jaclyn has performed and recorded extensively on flute throughout the USA and Japan, playing selections from genres as diverse as funk, hip hop, jazz, reggae, edm, classical, folk, pop, tribal, techno and drum & bass. Recordings include a Sony Japan release with correlating MTV Japan video. As a lover of travel, Jaclyn does not let distance keep her from making music, but sees it, rather, as an opportunity to explore a new local culture. With teams currently located in New Jersey, Philadelphia, NYC & Central Florida, Jaclyn and her fellow musicians welcome musical inquiries from near and far alike. A prizewinning violist, Adelya’s numerous awards include First Prizes at the Andrey Korsakov International Music Competition, Eugen Coca International Music Competition, All Russian International competition, and a First Prize and special prize for the best performance of a commissioned work at the International J.S. Bach Competition. Named Fellow of the Art Ministry of Russia and Russian Performing Art Foundation (2003-2006), Adelya has performed in Moscow, Saint Petersburg, Sochi, her native Kazan, and throughout other large cities in Russia. Selected as a principal violist of numerous youth international orchestras under direction of prominent conductors, Adelya has been working professionally in the Kazan State Chamber Orchestra “La Primavera” and the Kazan State Symphony Orchestra. Adelya was selected to join iPalpiti for its east coast residency in 2009, and has since performed as an orchestra member and soloist in concerts throughout America, including the Kimmel Center in Philadelphia, Carnegie Hall in New York, and Disney Concert Hall in Los Angeles. A graduate of the Kazan State Conservatoire, she has been studying in the United States since 2009 in the international studio of Professor Eduard Schmieder of Temple University’s Boyer College of Music, where she received an Artist Diploma, Bachelor’s, and Master’s degrees. In 2014, Adelya received her DMA from Temple University where she worked with Professor Daniel Avshalomov, violist of the eminent American String Quartet.